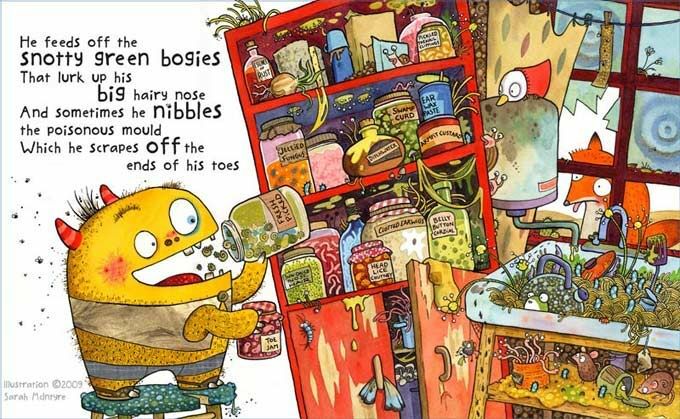 Oh hello, I am allowed to show TWO spreads from my upcoming book with Giles Andreae, Morris the Mankiest Monster. So here's the second one! I got to write all the little labels on the jars. At first, Hannah the editor said that some of them were too nasty and I'd have to rewrite them. But I think maybe she forgot, 'cause they're still there... heh heh. I used the first scene in the film Withnail and I as visual reference for a truly grotty kitchen. You might recognise the curtain pattern, water heater and gunky sink. This is great! Was this done with watercolors? Yup! And a tiny bit of collage. OMG that is awesome! LOL@ the withnail and I reference. So many brilliant little details! And is that a fly dotting one of the i's? I love the vegetables sprouting on the shelf. Wow - this looks so great! looks great, sarah, must've been great fun to draw -- i LOVE the fact that you used withnail and i (brilliant film!) as reference material for the kitchen.. Thanks! And you've been turning out some amazing stuff lately! the colours are fantastic and I love all the detail - the fox out the window, the little mice, the frog, will most def be picking up a copy. Okay, so I'm being random again but I like the way you start this post with 'Oh Hello'. It reminds me of a lolcat. They often say 'Oh Hai' as in 'Oh, hai. I was trying to protect your fish when it fell out of the bowl but then I tried to put it back...' 'Oh hello' is an odd way to start a blog post. Do keep it up! 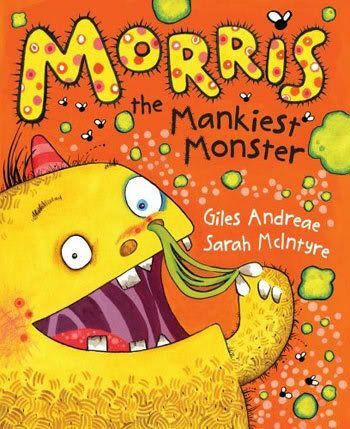 Morris still looks great. I can really relate to the expression on his face on the cover. There's also something disturbing about his shorts that I can't quite put my finger on. When you were SLEEPING. Ooooooo! I absolutely LOVE his body hair, that's drawn by way of genius. Thanks, Viv! Yes, my kitchen isn't as spotless as it should be right now. In fact, I think I have a sink half full of india ink water, I should probably go take care of that. This is sooooo good! I've just spent a good ten minutes looking at all the detail in the picture and I was still discovering new stuff. All the little creatures, the labels on the jars, the mankiness of that sink. Kids are going to love this book! Aw, thanks! I had a lot of fun with the details on that one! Tastes nice with head cheese.